Pack your bags and get ready for the journey of a lifetime through Botswana and Zimbabwe. Guided through the eyes of local experts, you will have the chance to admire the highlights and hidden treasures of Victoria Falls, the Chobe National Park, Khwai Community Area and the famous Okavango Delta. Embrace the unique opportunities to be led off the beaten path, discovering a whole new world of wonders, usually never exposed to visitors. Learn about the rich history, experience the fascinating game viewing and wildlife experiences. From unique lodges to the magnificent game, you will be rewarded with experiences you could have never imagined and memories you won't ever forget! Make the most of your time at the Victoria Falls Safari Lodge with a variety of activities. Highlights include the Vulture Culture experience, hide sites and game walks. Take advantage of the hourly courtesy shuttle to Victoria Falls Rainforest and the town center, in order to further enhance your experience with individual exploration. There are several scenic trails that run through the Rainforest and offer incredible views of Victoria Falls, a sight that you cannot miss during your stay! Head back to the lodge in the afternoons to take a dip in the swimming pool, which overlooks the action at the waterhole. Facilities on site also include a Health & Beauty Spa, 24-hour room service, a library and games room for you to enjoy. Today you will check out of the Victoria Falls Safari Lodge and transfer to the Kanase Airport for your quick local flight to Ghoha Hills Savuti Lodge. On arrival at the airstrip, you will be met and transferred to the lodge to check in and enjoy the beautiful surrounding area. Guests usually arrive at Ghoha around midday or later in the afternoon, you can join for high tea in the main area. Here you will be introduced to your guide and he will take you on a sunset drive along the private road network around the lodge. This will end at the scenic Baobab site with breathtaking sunset views and sun-downers served. Photographers as well as nature lovers will experience a very unique landscape during sunset, which is usually filled with Elephants, Giraffes and Roan Antelope to name a few. If an afternoon drive is not what you are after, you can relax in the private thatched viewing deck overlooking the water hole. From this private elevated setting you can view the arrival and movement of a wide variety of game, quenching their thirst in the pan. Some of the sightings may include Kudu, Impala, huge numbers of Elephant, Giraffes, Roan Antelope, Steenbuck and Buffalo. You might also spot the Ghoha pride of Lions that roam mainly between the lodge and this waterhole, as well as Spotted and Brown Hyena. Chobe National Park features one of the largest concentrations of game in all of Africa. Located in Northern Botswana, it was the country's first National Park and is now the third largest in size and most biologically diverse. For these reasons, Chobe is an essential bucket list destination, while on safari in Botswana. The Chobe floodplains and Chobe River provide a sensitive ecosystem, where the wildlife concentrate during the dry season. It is not uncommon to see between 500 and 5,000 elephants on these floodplains at one time! Between the combination of wildlife, bird life and reptiles that are scattered along the banks of the Chobe River, this National Park is a photographer's dream. Enjoy a day of lodge activities at the Ghoha Hills Savuti Lodge. After an early continental breakfast at 6:30 AM, you will depart from the lodge around 7:00 am and return in the late afternoon (depending on your needs and different sightings). The first stop and stretching point will be the Cathedral of Baobabs with some outstanding photographic opportunities. A professional guide will ensure that you are exposed to all the different landscapes and wildlife the area has to offer. A full day safari includes waterholes, marsh area, baobab stretching points, riversides and grasslands. Just to name a few: Harvey’s Pan, where so many animals roam daily, the Savuti Sand Ridge, the Kudu Hills, Quarry hill and rock climbing to get a close view of the Bushmen Rock Paintings, seeing the Pimple Hills as well as Twin Hills. Visiting the the Twelve Baobab theater on the way. En-route back to Ghoha hills in the afternoon a late afternoon refreshment stop at the local pan or thatched viewing deck may be the order of the day. Today you will check out of the Ghoha Hills Savuti Lodge and transfer to the airstrip for your quick local flight to Machaba Camp. On arrival at the airstrip, you will be met and transferred to the lodge to check in and enjoy the Khwai Concession Area. Today you will check out of the Machaba Camp and transfer to the airstrip for your quick local flight to Sanctuary Stanley's Camp. On arrival at the airstrip, you will be met and transferred to the lodge to check in and enjoy the Okavango Delta. The Okavango Delta is one of the world's largest inland deltas situated in the middle of the largest stretch of continuous sand in the world - the Kalahari basin. This oasis in the middle of the desert is a rich yet fragile ecosystem, providing a life source for an incredible variety of wildlife. A wealth of species have adapted to the contrasting conditions created by living in the harsh Kalahari desert which is transformed annually with the arrival of the delta flood waters originating in Angola. Sanctuary Stanley's Camp offers a wide variety of game viewing in the Okavango Delta, exploring a variety of habitats. During your time here, you can enjoy occasional game drives in open sided safari vehicles, including night drives and walking safaris with an armed professional guide. 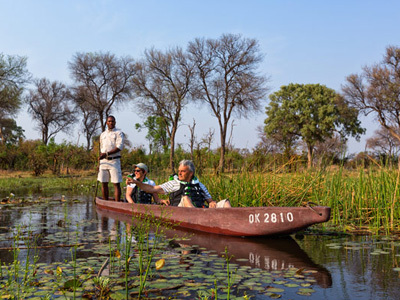 The Okavango Delta is flooded for much of the year and when it is, you are invited to experience the serene silence at the gentle pace of a poled mokoro excursion along the narrow channels. Sit back and relax, as you glide in a local dugout canoe, coming eye to eye with buffalo as they drink water from the river, watching crocodiles sunbathe on the banks and cruising past a pod of hippos as they lie in a pool. Fish eagles, frogs and stunning floating lilies contribute to much of this experience, but more frequently it is the quiet silence and gentle pace that will forever leave an impression. Your professional guides will also show you the bush on foot. This is a chance to see the Delta and surrounding environment from a different perspective. Walking excursions give you a front row seat to the aftermath of the action during the night, with hints left in the smooth sand of the road. Lion, leopard, elephants and even millipedes are all part of the signs, each with their own story to tell. A walking safari is focused on seeing the small five and the various flora in the area. Because of the popular water activities in this region, game drives are not as common as they are elsewhere. However, they can sometimes be combined with motorized boating excursions. Sanctuary Stanley's Camp is set in a private concession, which means you are able to venture out at night on exciting game drives, which showcase the many nocturnal animals that live here. The evening drive starts after sundowner cocktails, using a spotlight to identify these hidden creatures. Today you will check out of the Sanctuary Stanley's Camp and transfer to the airstrip for your local flight to Maun Airport. On arrival, you will check into your international outbound flight onwards. We hope you had a great Safari experience! Built of thatch and timber, the Victoria Falls Safari Lodge rises seven levels tall and offers the impression of a vast open-plan tree house. Surrounded by nature and wildlife, this property faces spectacular views of colorful sunsets and the vast woodland eco-region of the bushveld. In between activities, you can take advantage of the many relaxing facilities on site, including a two-tiered swimming pool and a private TV lounge. Enjoy meals at the award-winning MaKuwa-Kuwa Restaurant and try out the famous Buffalo Bar, which was included in Heinekens Great Bars of the World list. The lodge proudly provides first class hospitality and service, working towards exceeding your every experience. Ghoha Hills Savuti Lodge is perched high on the Ghoha Hills, overlooking the vast expanse of Savute within the Chobe National Park. The lodge is situated 20 km from the Savute Channel and approximately 45 minutes from the local airstrip. Thanks to its elevated position, this property offers breathtaking views, unique in Botswana. The lodge was designed to take full advantage of the scenery, so whether you are dining on the terrace, taking a swim in the pool or lounging on the balcony of your chalet, you can marvel at the natural beauty. This exclusive property features just 9 canvas chalets and 2 family units with en suite facilities and private viewing decks. Stanley's Camp is situated on a 260,000 acre private concession in the Okavango Delta, bordering the southern section of Moremi Game Reserve. The camp is situated in an exclusive community area and works with the local community to create an awareness and commitment to conservation, while offering a wealth of wildlife activities. 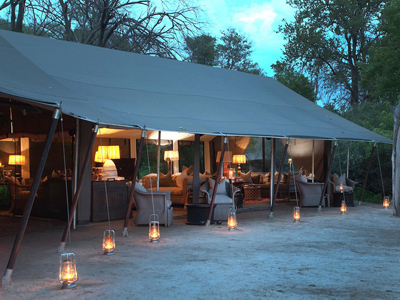 Guest accommodation consists of eight elegantly styled safari tents. The comfortable spacious tents exude classic Africa. Handcrafted beds dressed with the finest linen and antique furniture were individually selected beside beautiful oriental carpets that transport you to early 19th century Africa. Each unit offers an en suite bathroom and a private balcony. Hammocks and Morris chairs on the balcony are perfect for relaxation in the African sunshine. Stanley's main lodge is on raised decking, featuring expansive views over the surrounding floodplains. The property has been carefully blended into the existing tree line, with a large sausage tree as its main support.